Today this is a condo building called ‘The Captain French’. It was built in 1910 to Parr and Fee’s design for George H French – who really was a captain – or at least the owner of a number of seagoing vessels. French was born in Ontario and first shows up in New Westminster in 1891, aged 39 with his wife Cynthia, 32. It’s not possible to read exactly what his occupation is, but the family’s religious affiliation is identified as Salvation Army. In 1901 he was living in Vancouver (aged 48) with his wife, Cynthia (42), where the census recorded him as ‘master mariner’, and they are now Presbyterian. The street directory show the family living at 350 Alexander, and his business address was 145 Alexander. His 24-year-old son, Austin, was living at 328 Alexander, also a master mariner with his wife, Mildred, and their two children, Clara and baby George. In 1911 he was living on Beach Avenue, and curiously his wife’s name seems to be Simyeon, or something like it (although we’ve noted the frequent errors in that particular census – as well as the cheap nibs the census-takers used for their pens). 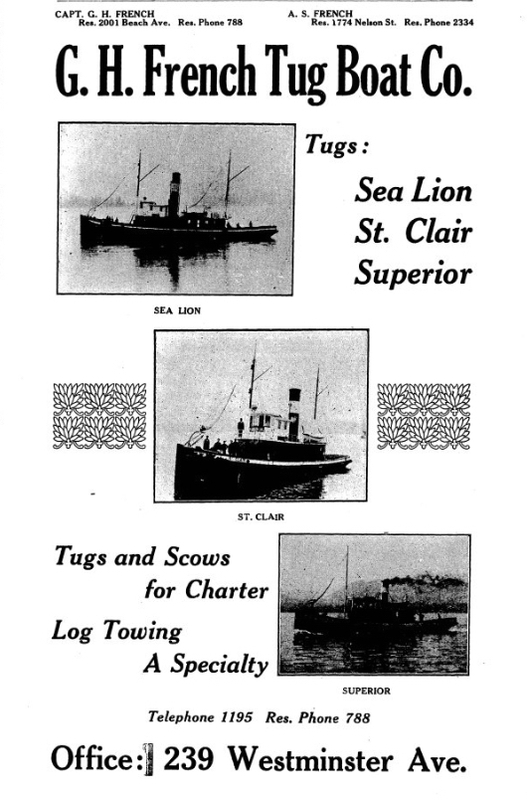 In 1910 Captain French’s tugs were listed as the Sea Lion, the St Clair and the Superior. A S French, who was living on Nelson Street was also involved in the tugboat company, but there was also the A S French Auto Co, founded in 1909, (whose premises had the same address as the Tug Boat Company). Austin French was also a Director of the Columbia Taxicab Co. In 1911 Captain French had either abandoned the ocean, or was downplaying it and A S French and Co were his main advertised business interest. The company was run by Austin French, but George was a partner in the dealership for both Napier Motors and Stoddard Dayton Cars. The Archives have an image of the Prime Minister, Sir Wilfrid Laurier in a Napier car in front of the CPR Station in August 16, 1910. Laurier opened the first Vancouver Exhibition at Hastings Park that year. The Napier was an expensive British-built automobile, noted for being the first car to cross the Rockies (from Boston to Vancouver) in 1904. Mulliner built the car’s aluminium body. Stoddard Dayton were a new company with high quality vehicles built in Dayton, Ohio. By 1911, Stoddard-Dayton offered twenty models with four different engines, and by 1912 when the company had become part of the United States Motor Company the advertising claimed “None can go farther. None can go faster.” With the dramatic expansion of sales of much cheaper Ford and rival cars, the company ceased production in 1913. 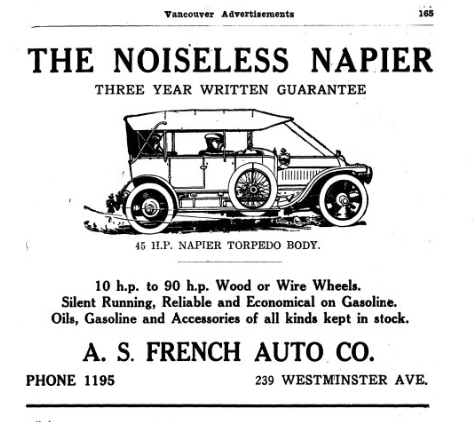 In 1911 the Daily World announced “The A. S. French Auto Co. are now occupying their new commodious quarters at 1027 Pender Street West, and have the largest fireproof and most up to date garage and sales rooms in British Columbia. They have a storage capacity for 600 cars, and carry besides a full line of accessories. The building is of reinforced concrete, absolutely fireproof, and with two floors, 66×132 feet In size. Each floor has a level driveway entrance, the lower being on Seaton street, and tha upper on Pender. When the outside decorations are completed, the building will present an extremely attractive appearance. “Any one wanting a. Napier car this season will have to hustle.” said Mr. A. S. French, “as the allotment for this year Is almost sold out. Nearly all the cars allotted us are In now, only five or six carloads remaining to be delivered. I have no idea how many Naplers have been sold in Vancouver without looking up the records, but as an instance of the way they are going I might mention that last week I sold over $42,000 worth, including the sales of Saturday night after dinner, which amounted to $19,500. We are open for business day and night. Besides the Napier we also handle the Stoddard – Dayton cars, which I consider the best car on the market for the money. The Napier is a British built car.” The showroom had cost $55,000, designed by ‘Blackmore’ (presumably E E Blackmore). Clearly with success like this Austin’s father could afford the new investment of the warehouse building he erected on Alexander Street at a cost of $24,000, built by Hoffmeister Bros, seen in this 1927 Vancouver Public Library image. A S French continued in business, switching to selling the Overland cars in 1916 (at only $850), and in 1922 the Chandler, Cleveland and Liberty Six lines of vehicles. George, Austin, and Austin’s son, (also George) were all associated with the company. The new warehouse had six tenants when it opened; Vancouver Scale and Butchers Supply Co, The International Battery Co Ltd, Shurley Deitrich Co Ltd (a saw manufacturer), Electrical Manufacturing Company, Kaufman Rubber Co Ltd and F F Henderson, manufacturers agents. In 1920 there was just one occupant, Martin Finlayson & Mather Ltd, the successors to the George Hunter Hardware Company. When the photo was taken in 1927 there were multiple tenants again, Ames Bros, (manufacturers agents) Imperial Stage Co Ltd, Wayne Pump and Tank Co, Wells Ltd, (who were ‘reconditioners’) Pacific Wire Ltd and Bartholomew Montgomery Ltd (electrical engineers). By 1935 Gainers Meats had moved into part of the building – their name can still be seen painted on the back of the building. They shared the premises with the Consolidated Sales Book and Wax Paper Co Ltd, who were a paper wholesaling company (if their name left you guessing). 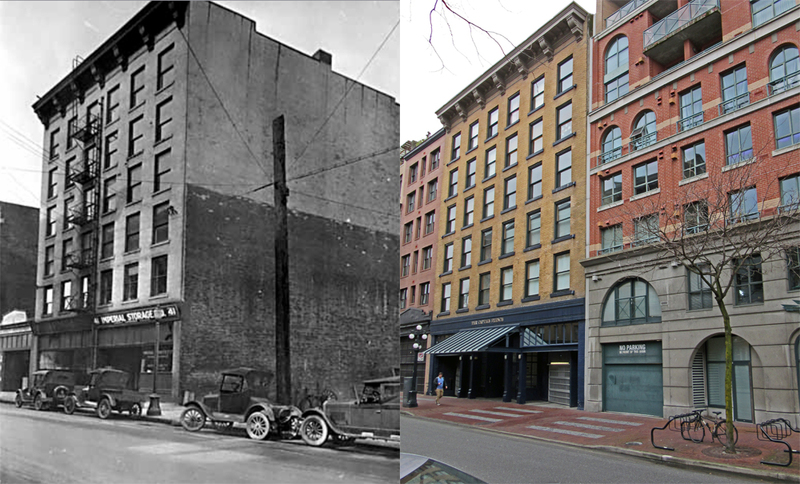 In 1990 the building was an early Gastown residential conversion, designed by Paul Merrick and creating 20 condos.